Your new favorite tank top is here. This gray women’s racerback tank boldly proclaims “Be the Voice,” and “#StopSuicide” in white lettering across the front. 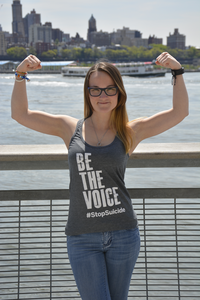 It’s a terrific way to stand up for suicide prevention…and be fashionable while you do it! Runs small.